Here, at last, are the answers to the Doors of Dublin Quiz. They were delayed until now because replies were still trickling in until just a few days ago. It’s probably also necessary to repeat a word of apologetic explanation, to readers who replied to the quiz but did not see their responses appear (until tonight). This was of course because each subsequent visitor to the quiz page could not help see the previous answers, so I had to conceal them until now. But if you responded to the quiz (via the comments bar) your answers should be published by now, on the original quiz page. In one or two other cases I did publish a response but edited out key information, for the same reason as above. In any case, the answers are now below. Congratulations to everyone who responded, And Thank you for taking part ! 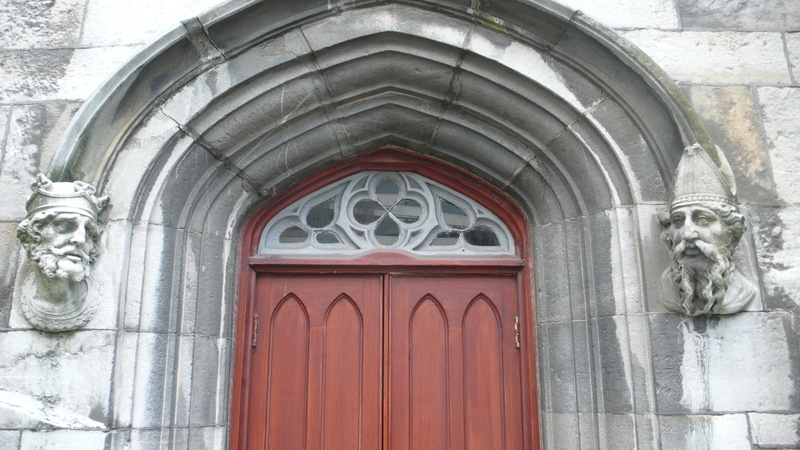 Picture 1- (above) This is the RC Church of saint Audoen’s, on High Street. 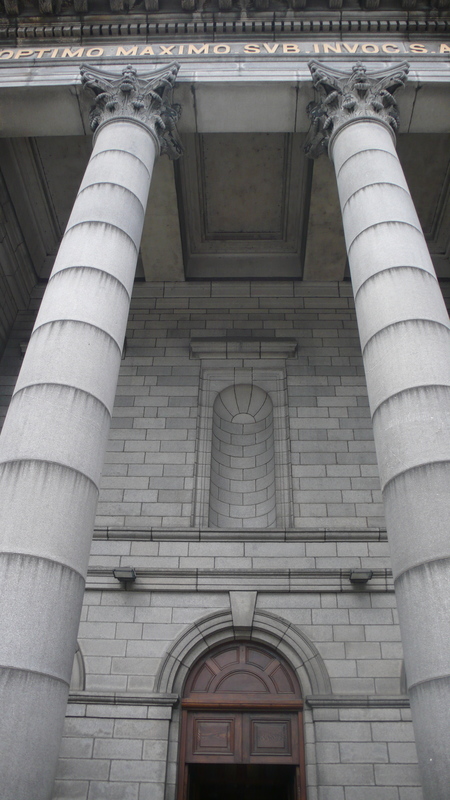 If one was feeling academic, pretentious or just art-historical, (depending on your point of view) one could remark that the massive, soaring Baroque Columns and huge Portico mark it out as a mid-late example of Church building in the post Repeal (of Penal Laws) era and of a resurgent Irish Catholicism, which tended to favour the Counter-Reformation architectural language of Roman Baroque. However, should you visit the church, I’d prefer to direct your attention to two seemingly dull and msishapen objects which flank the entrance door, (just below and out of frame here alas) . They don’t look like much, but they are in fact the two halves of an enormous Giant Clam from the Pacific South Seas. This is not definitive, but I’ve heard the clam came from Capt James Cook legendary 3rd voyage of exploration, (yes, the one where Europeans charted California, Alaska and New Zealand for the first time) Saint Audoen’s clams represent a little taste of history then. Door 2. 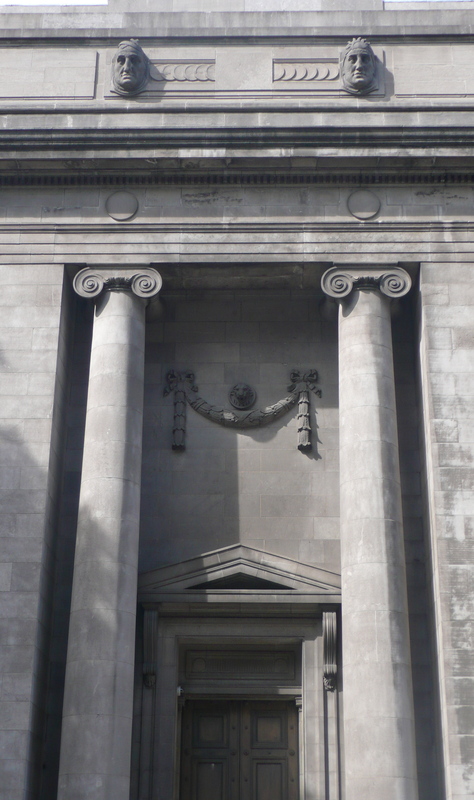 (above) The Ulster Bank on College Green. 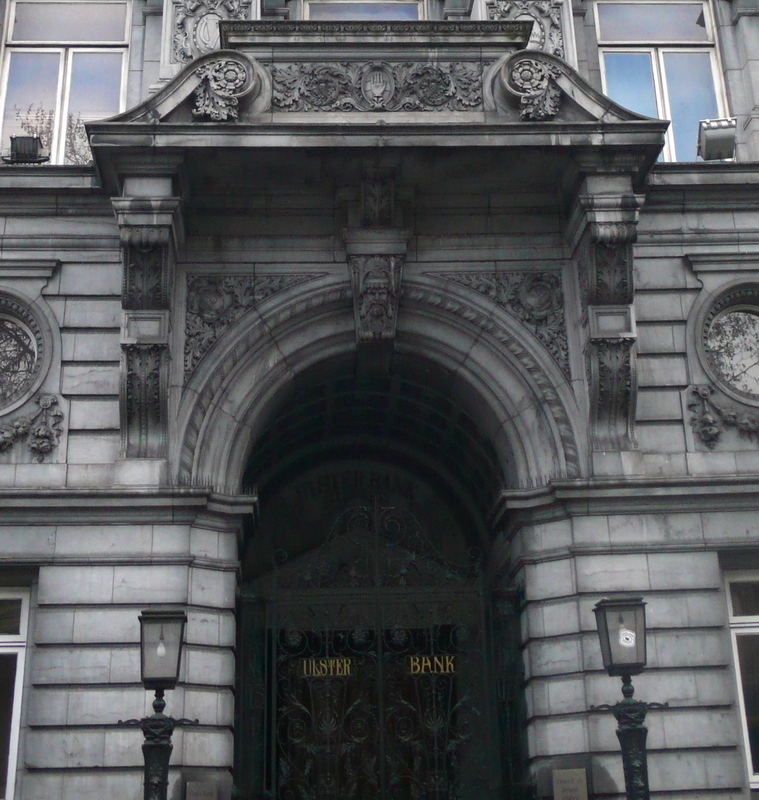 A show piece building for the bank, on the street where Irish banks traditionally built their showpiece or headquarter buildings, presumably in a spirit of some competition and keen to display their solidity, taste and prestige. Accordingly these buildings tend to be of superb quality, and the College Green full of wonderful and ornate buildings and details. I haven’t consulted any of the real authorities as yet, but with some trepidation I’d characterize this as French influenced or perhaps Flemish Baroque. 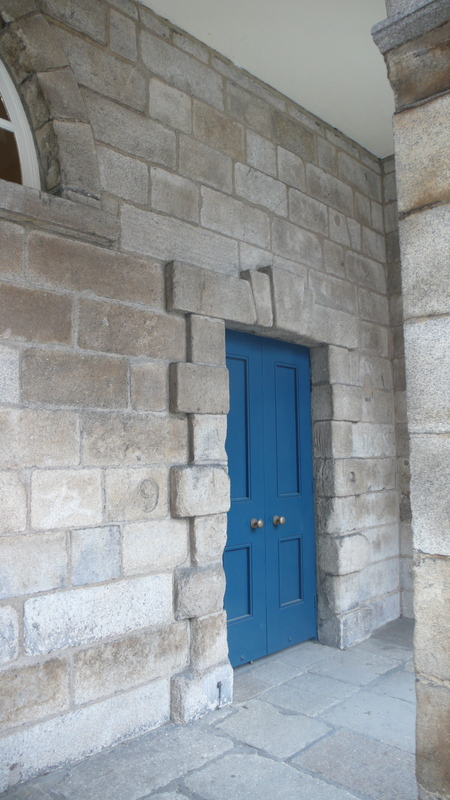 Door 3- The massive, almost indestructible granite masonry shouts naval, nautical or perhaps admiralty construction, so you’d certainly be forgiven for guessing a Martello Tower, although the angle of that wall is not quite right. 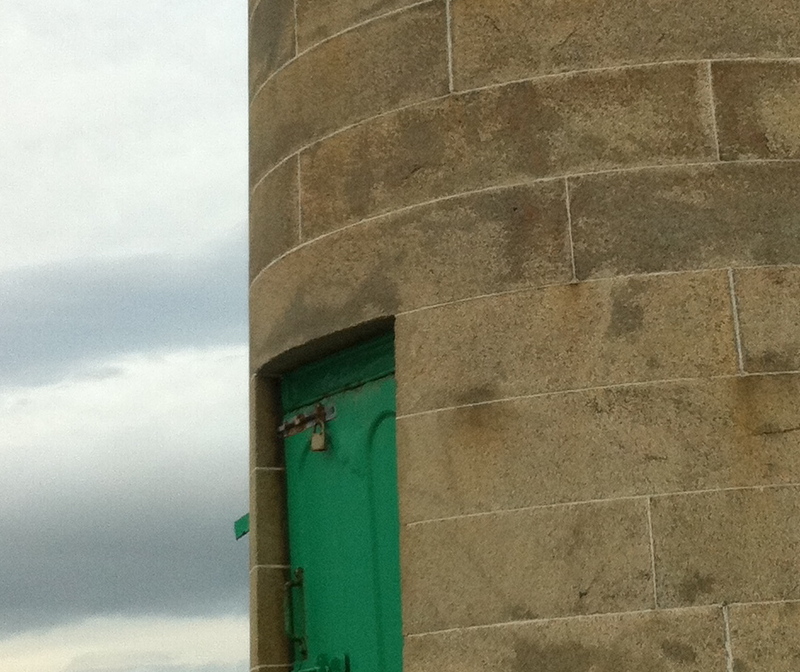 In fact this is the small but perfectly-formed lighthouse standing proudly and guarding the end of Dun Laoighaire’s West Pier. I love the green door . The concentric rings of granite that surround the pier surface, in rings circling around the little lighthouse, also never fail to please. 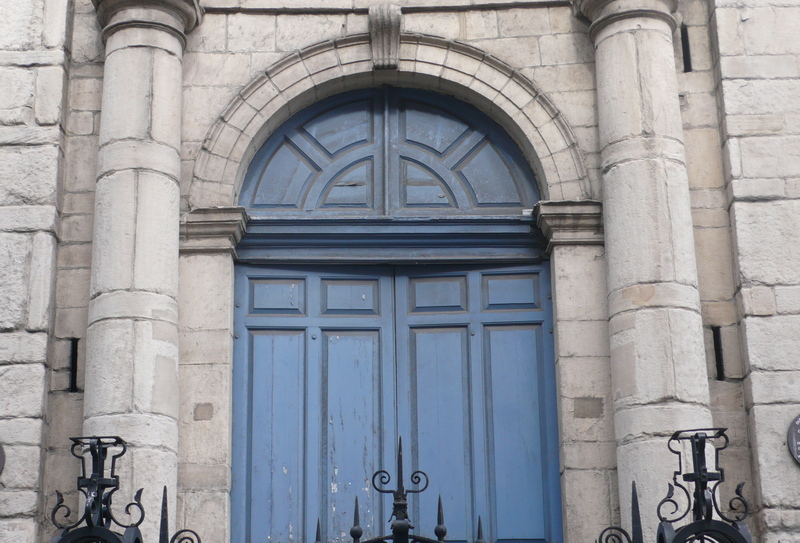 Door Picture 4 above is- One of the most iconic buildings of Dublin, this is of course the church of Saint Stephens, universally known as the Pepper Canister Church. 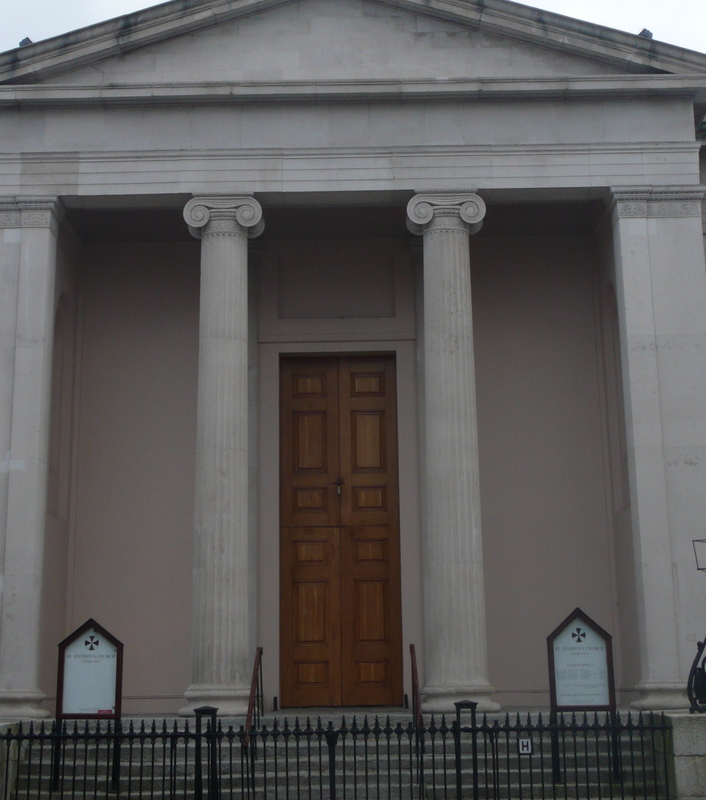 It is one of the loveliest of Dublin’s 18th century churches. It will not have escaped your attention I tried to make this question more difficult, by framing out the eponymous Pepper Canister” bell tower. Among other correct answers, Alan Sweetman, Anna Rackard and Emmeline Henderson were not fooled. 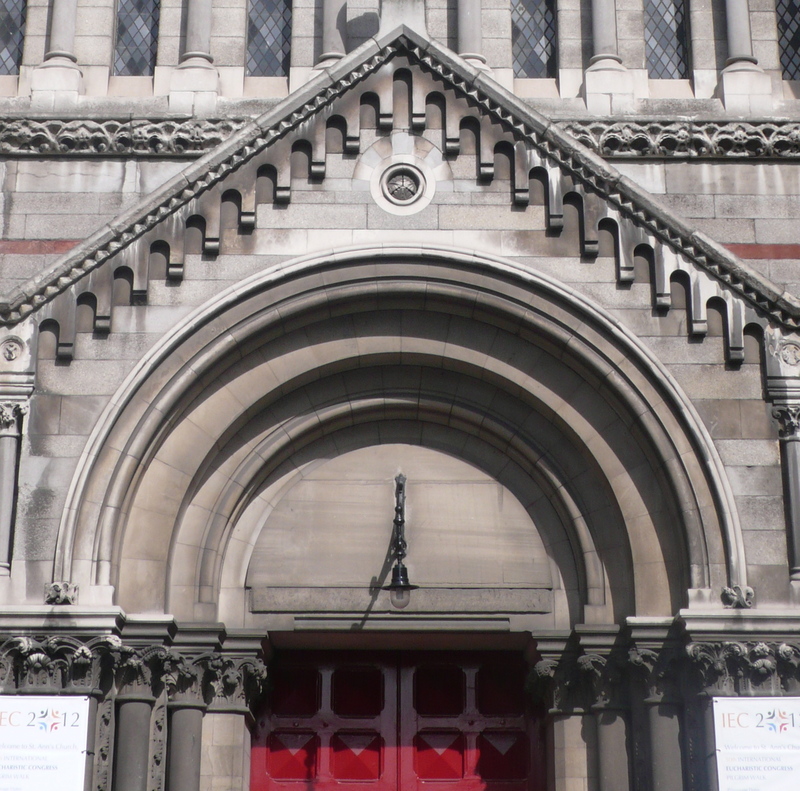 6- This extravagantly neo-Romanesque door above is of course from St Anne’s Church, Dawson Street. The main architect was Sir Thomas Dean, of the firm later known as Dean & Woodward. 7- A detail from Dublin Castle. This nice blue door is to be found by the Palace Gate, in other words thats the gate which is topped by the allegorical figure holding the scales of Justice, and the gate which leads out from the Upper Castle Yard outwards and indeed down to the Royal Exchange/City Hall and the old Newcomen Bank. Yes, you’ve got the one now. Picture 9, above- This was admittedly tough, or more accurately imposible unless you’ve visited this place, since these are not doors visible from the street. This is from the yard of an old OPW depot (off Ladd Lane & Baggot St Lower) which has now been leased by a collective of artists, who call it Moxie Studios. 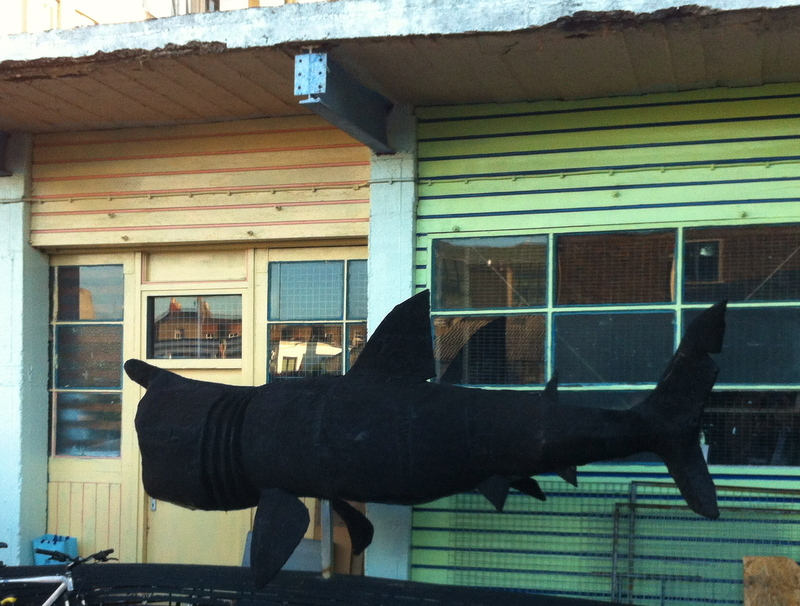 As you see one of the resident artist has built a curragh and a nice basking shark. I also just liked the colours of the doors & surrounding woodwork. 10- Well done to everyone who recognized Taylors Hall. I know this was a very tough quiz, so i was especially impressed by those clever and determined readers who had multiple or repeat looks and sent additional answers after their first go. Tig Mays and Alan Sweetman take a bow as they each took a second look & detected the tiny blue square in the picture which is the An Taisce symbol and thus correctly identified this as Taylors Hall. This is the last surviving guild hall building in Dublin, a relic of the guild system that used to dominate the trade, commerce, and politics of every town & city in medieval and Renaissance Europe. 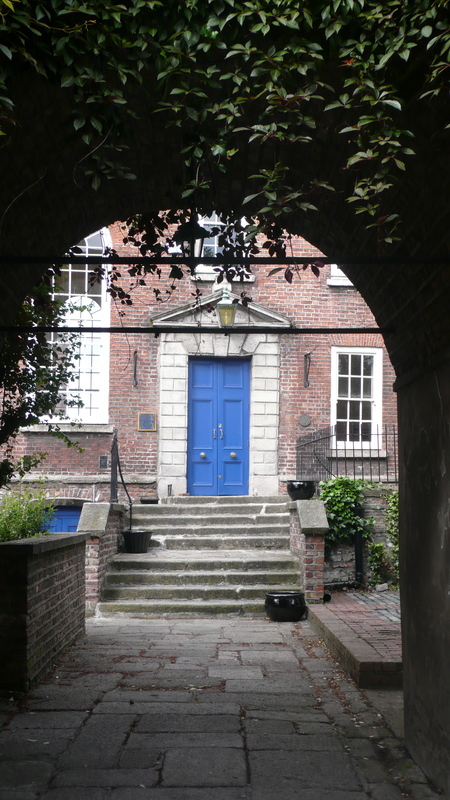 11- The Chapel Royal in Dublin Castle, well done to many of you who saw Saint patrick and Henry II flanking the door. 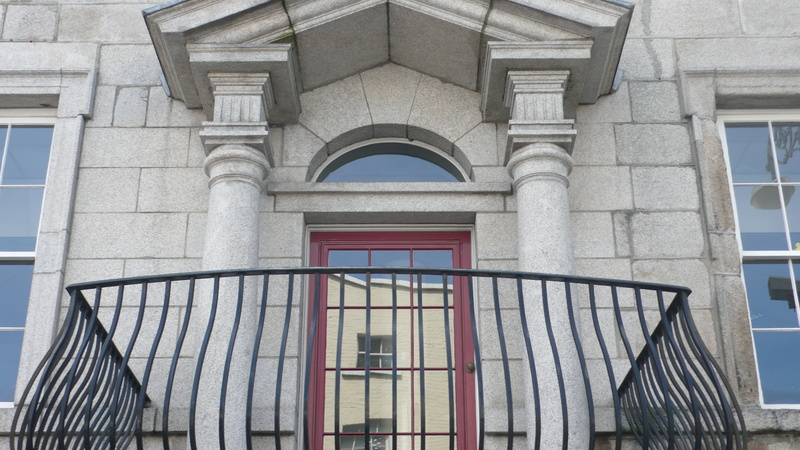 Picture 12, above- The Mercer Hospital or Medical Centre, this door is at the top of and looks down the length of, South William Street. I have nothing interesting to say about this building. 13- The fantastic Saint Weyberg’s Church. 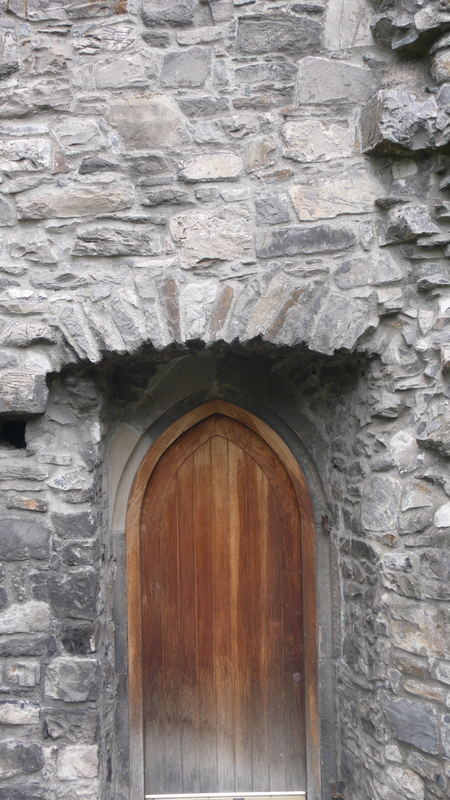 I love the old stone-sculpted skulls which adorn the stone work just above this doorway, (deliberately framed out of shot here because I thought it might be a giveaway) Lord Robert FitzGerald, one of the leaders of the doomed 1798 United Irishman Rising, was christened here, along with many other prominent citizens. 14- The last door answer, and also the last of three pictures from Dublin Castle. This bit of the catle complex is among the clutter of buildings that runs along that lane, between the rear of the State apartments on one side and the Dubh Linn circlar Gardens & Chester Beaty Library on the other. 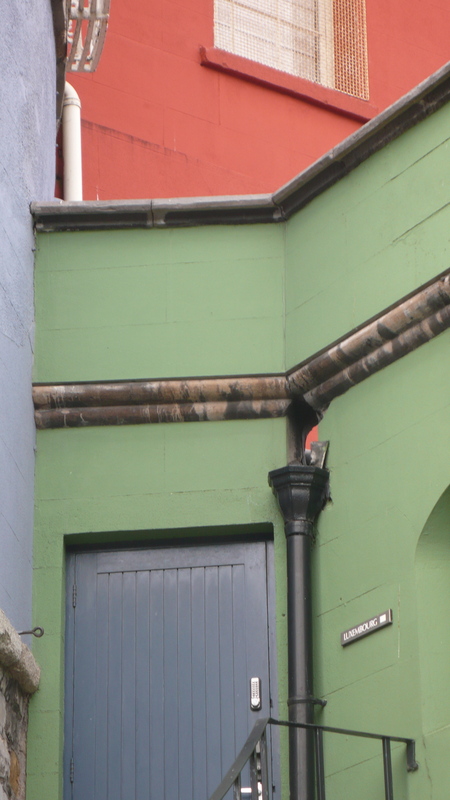 The OPW or some similar body has taken to painting these wall bright colours, which ought to look wrong but somehow works well. Thanks again to everyone who took part, I loved getting your answers and I hope you enjoyed a few head-scratching moments. Any feedback or criticisms most welcome, as always. Please post any feedback via “Comments”. I’ll do another quiz pretty soon. Better warn you now.. it’ll probably be Dublin windows, bridges or maybe even or maybe Dublin columns! So look around. But not while crossing the roads! Arran. I missed the contest, but found your answers. Cool post. Cheers. Thanks for the kind comments BT, delighted you enjoyed it. Compliments in return on your own blog, very nice. I try to do a picture quiz like this, or a little piece on Dublin history & architecture, every 2 weeks or so, so please drop by again,. Best regards- Arran. Hi Julie, don’t despair! It was a really tough quiz. A couple of the people who submitted answers were architectural historians or conservationists (ie: professionals, basically) and not even they could get all the answers. Not a single person got 14 or even 13 right, and some of them as I say were basically pros. It really was that tough. Specifically about Question 1- the big (RC) Saint Audoen’s- don’t worry, loads of people got that wrong too! Those huge columns made a lot of people jump to say the old Parliament on College Green, they are so big (the columns) it was natural guess. Really glad you enjoyed it and that you had a go. A new quiz will be on the way soon! Did you not read the answers in the articles above?! Have a read and see! Ah, I scan too fast, will stand in the corner for ten minutes. But my request stands. hi Wordwatch, you sound so contrite and charming, all is forgiven. Thank you too for your kind words on my (rapidly-scanned!) piece above. 😉 To answer your other request, no I haven’t written or pressed anything to date on the Martello tower where Joyce stayed and where the first chapter of Ulysses is set, although of course I know it very well. I grew up in that area, my family still lives there, and I often swim in the sea just below the tower, in the famous bathing spot known as the Forty Foot, as do Dedulus & Buck Mulligan, in the same first chapter. Briefly, in real life Mulligan was based on Joyces friend Oliver St.John Gogarty. poet and surgeon, the two were I believe friends from college. (the Royal or Catholic University, (now re-located & called UCD). Mulligan had more (family) money & he had leased the tower, presumably from the Admiralty, (although you should check up on that). Originally, it was of course designed as coastal defense, gun emplacement, and as a watch/signal tower, to defend Ireland from French invasion during the Napoleonic Wars, 100-odd years earlier. Next Post Results of Doors of Dublin Quiz.